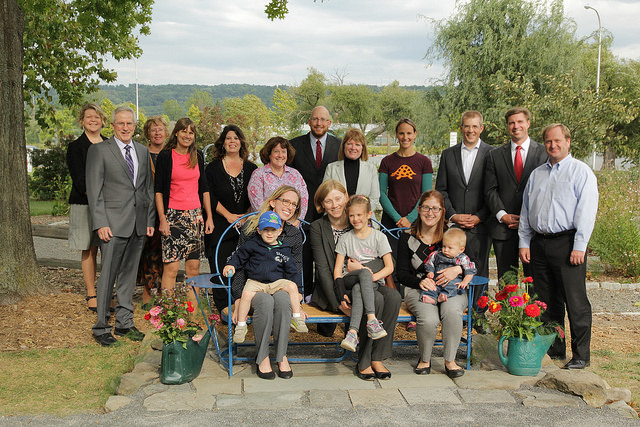 Ithaca-based accounting and business consulting firm Sciarabba Walker & Co., LLP dedicated a custom bench to the Ithaca Children’s Garden in honor of the firm’s 40th anniversary. The firm was founded by Andy Sciarabba and Kenneth Walker in 1976 and has since grown to 50 employees. In addition to tax, accounting, and audit services, the firm provides financial consulting and has specialty groups dedicated to niche areas such as international tax and high-technology. “To celebrate 40 years of service to the community, we wanted to donate a gift that can be enjoyed by local residents and guests for years to come,” said Sciarabba Walker managing partner Dave Iles. “By providing a new bench to the Ithaca Children’s Garden, we are able to show our appreciation to our clients and the community at large.” The Ithaca Children’s Garden is free to the public and draws more than 54,000 visitors annually. The one-of-a-kind bench, designed and built by local artist Durand Van Doren, is located at the edge of the Village Green, under the Pin Oak that separates the Hands-on-Nature Anarchy Zone from the Bulb Labyrinth Memorial Garden. The back of the bench is reminiscent of the local waterfalls and gorges, representing Sciarabba Walker’s strong connection to Ithaca. Sciarabba Walker & Co., LLP is a CPA and business consulting firm with offices in Ithaca and Cortland. Founded in 1976, the firm is committed to actively responding to clients’ needs, providing career development opportunities for its staff, and serving as an active leader in the community. More information can be found at www.swcllp.com.